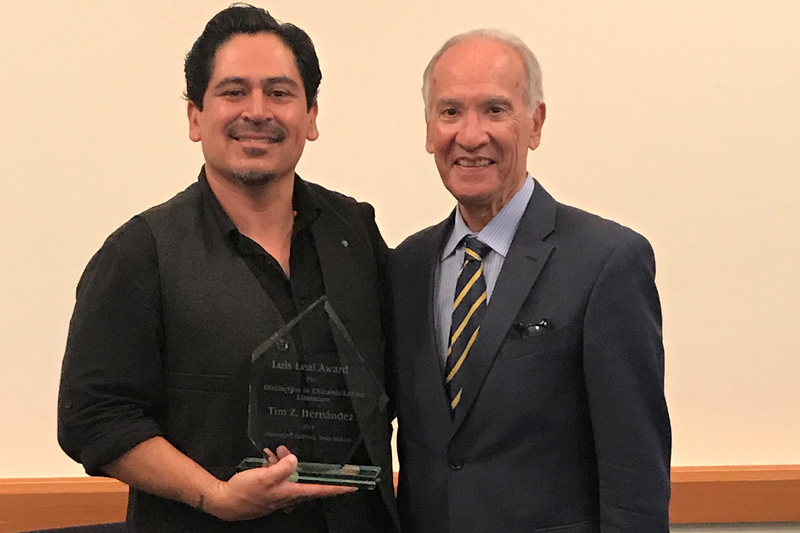 Last evening, Tim Z. Hernández received this year’s Luis Leal Award for Distinction in Chicano/Latino Literature. 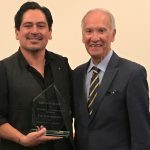 The Leal Award is named in honor of Luis Leal, a professor emeritus of Chicana and Chicano Studies at UC Santa Barbara, who was internationally recognized as a leading scholar of Chicano and Latino literature. Previous recipients of the award include Norma Cantú, Francisco Jiménez, Demetria Martínez, Jimmy Santiago Baca, Graciela Limón, Pat Mora, Alejandro Morales, Helena Maria Viramontes, Oscar Hijuelos, Rudolfo Anaya, Denise Chávez, Hector Tobar, John Rechy and Reyna Grande. Tim Z. Hernandez was born and raised in California’s San Joaquin Valley. An award-winning poet, novelist, and performer, he is the recipient of the American Book Award for poetry, the Colorado Book Award for poetry, the Premio Aztlán Literary Prize for fiction, and the International Latino Book Award for historical fiction. His books and research have been featured in the Los Angeles Times, the New York Times, CNN, Public Radio International, and National Public Radio. His most recent book, All They Will Call You, is the harrowing account of “the worst airplane disaster in California’s history,” which claimed the lives of thirty-two passengers, including twenty-eight Mexican citizens—farmworkers who were being deported by the U.S. government.